The EuroLeague Players Association is turning its attention to some potentially dangerous floor issues. “Never played on a more slippery court than Gran Canaria. Players were slipping every possession in practice today,” Maccabi Tel Aviv guard Scottie Wilbekin tweeted Thursday (15/6), nearly 24 hours before his team’s game against Gran Canaria for Round 7 of the EuroLeague regular season. Wilbekin’s comments came less than a week after Anadolu Efes head coach Ergin Ataman heavily complained about how slippery the floor of Gran Canaria Arena is, characterizing it as unfit for EuroLeague basketball games, during the post-game flash interview and the press conference following his team’s win over the Spanish team. Efes guard Shane Larkin had been injured during practice in the gym, something that was a result of the slipperiness of the floor, Ataman said. The EuroLeague Players Association has taken notice of these complaints, per its president, Fenerbahce forward Gigi Datome. The Italian player told Eurohoops that ELPA has taken into consideration all these negative comments regarding the status of the court and the possibility of being so slippery that can become unsafe. Furthermore, Datome said to Eurohoops that court stickers and the potential danger they might pose to the players’ health are also on the agenda of ELPA. There have been cases of injuries that were caused by players (including Datome’s Italian national team teammate Daniel Hackett, who suffered a season-ending detached femur tendon in December 2016) slipping on the advertising stickers and many others (such as former Final Four MVP with Fenerbahce and current Utah Jazz center Ekpe Udoh, 2016 EuroLeague champion with CSKA Moscow Aaron Jackson, Maccabi wing Michael Roll and others) have spoken against their use. 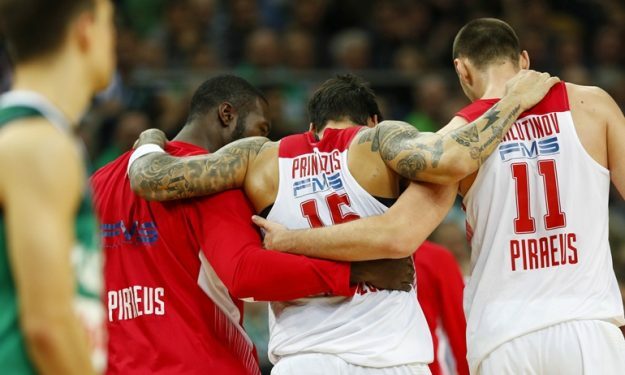 UPDATE: ELPA confirmed that they are in contact with the EuroLeague in order to solve the issue. We can confirm that we are communicating with @EuroLeague regarding removal of slippery floor at Gran Canaria Arena. This floor does NOT fit in top European competition (or any other professional competition).